4th of July is just a week and a half away! We decorated Maylees playhouse for the fourth so she can enjoy it for the next week and a half! 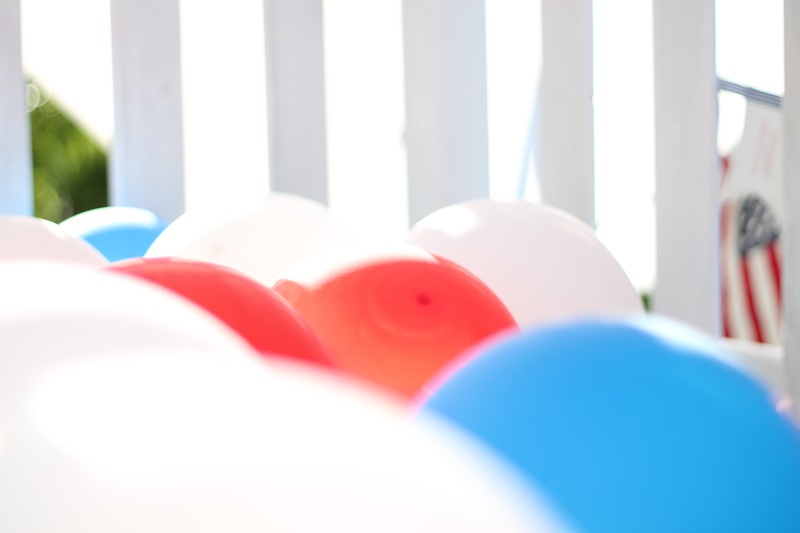 We thought we would also give you some ideas for kids at a 4th of July party or barbecue. On the outside of the playhouse we set out this old vintage table that has little bits of red. We placed some old patriotic books that kids can look through. The kids can then eat their dinner and their treats that they buy from the lemonade stand. On the other side of the front porch we decided to set up a little lemonade and candy stand. 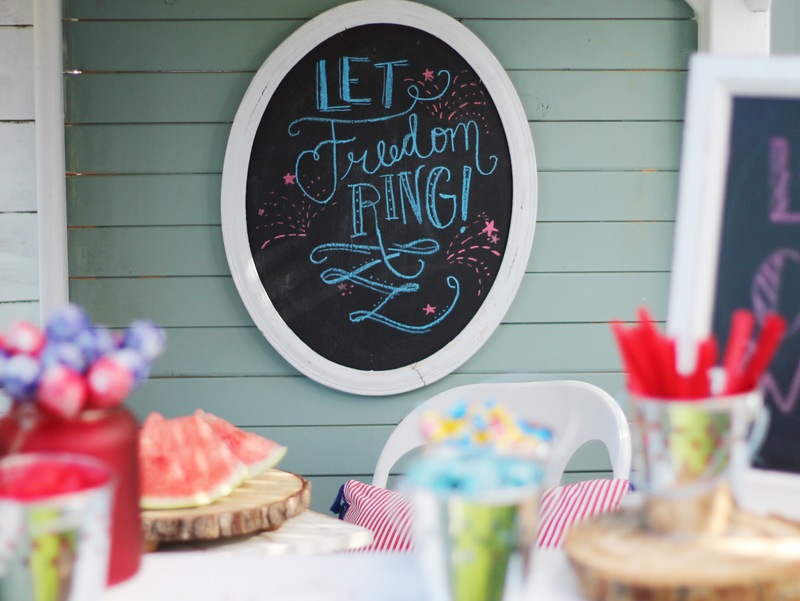 We thought this would be such a cute idea for a 4th of July party! We filled little buckets that we got at target with candy and made this sign on the chalkboard to advertise the cost. On the sides of the lemonade stand we set out these adorable little tiki lanterns. Under the candy stand we placed a bunch of old baseballs that we had in the wheel barrel. 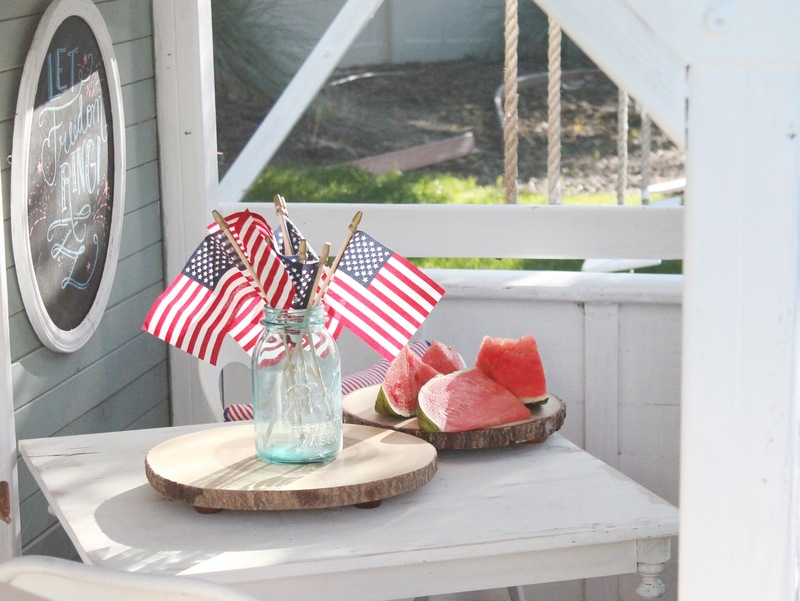 You have to just think about what random American, red white and blue decorations and things you have around and bring them out for the fourth. Of course the candy was Maylees favorite part of the playhouse. I have to chime in about Maylee’s cute dress. I(Chelsi) started making them and selling them over at my Etsy shop. Go check them out here! Inside we have Maylees little table that we placed watermelon on along with some little flags. We dresses up the chalkboard for the 4th as well and hung some vintage school flags to give it more of an old club house feel. 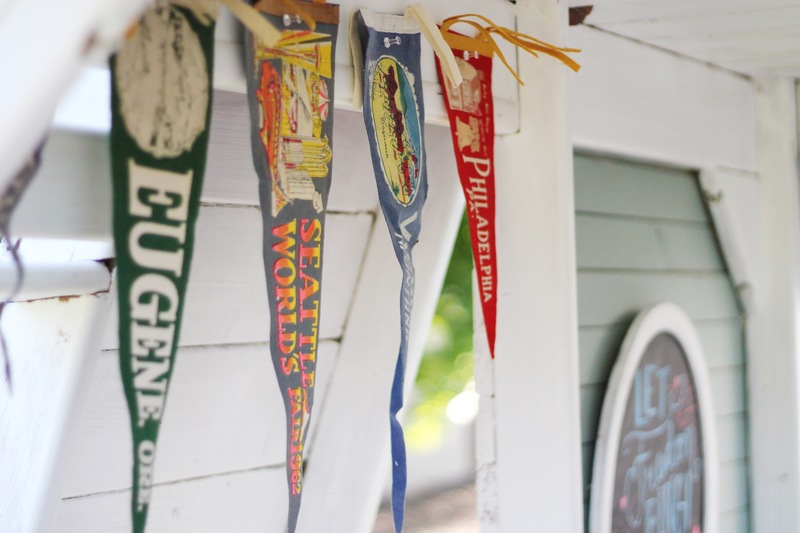 Back to ththe outside… we hung two flags from the playhouse. I love these two flags hanging here because it feels like a real house with the flags flying. We then strung a few banners across the front that we found at target and placed little flags in the flower box. In the upstairs of the playhouse we added a simple star garland and some balloons! What little kid doesn’t like to play with balloons!? We thought it would be something fun and different for the kids to play with in here. And here is the entire playhouse! We are excited for a Fourth of July party and to have some kids come join Maylee in fun, and the candy sale! Thanks for stopping by! If you didn’t notice here is Maylee waving bye to y’all! Have a happy Fourth! Hello! 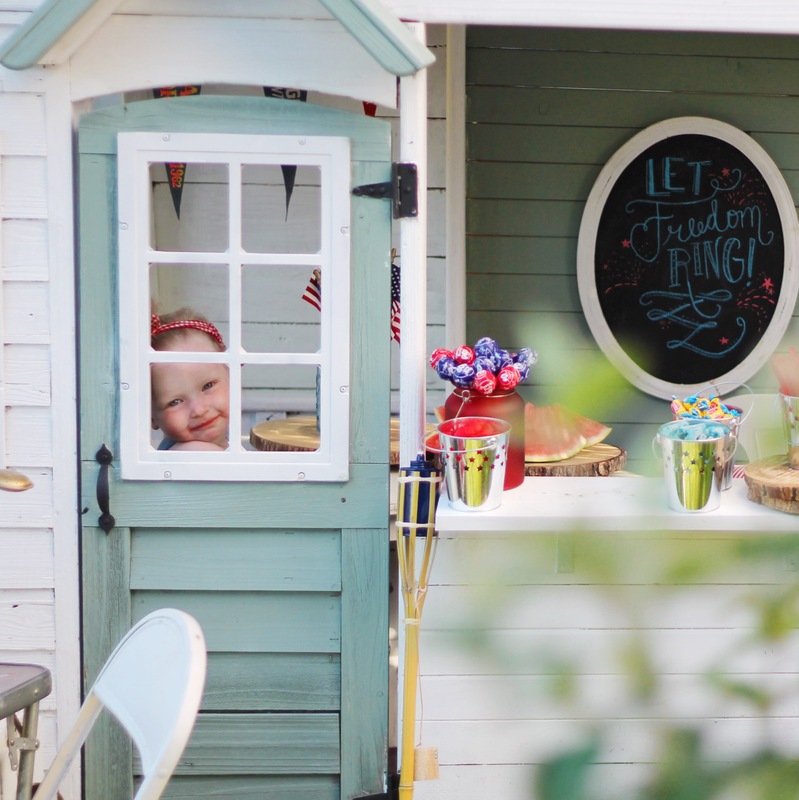 I just love what you and your parents did for this beautiful playhouse makeover! I was lucky enough to find this very same playset on my local Craigslist and I bought it to do this makeover on it! I have a question or two about how things weathered and what you maybe did to prep it for winter! I notice you took out the play kitchen, any particular reason? I’m wondering if I close up that corner with the shiplap a kitchen set would do ok year round inside. I live in the PNW so not a lot of snow but a TON of rain! Also do you take the plastic lavender window box in for the winter? How does it do outside in the rain? I got a very similar one from TJmax. I will also be painting the slide the previous owners already painted it (just brighter yellow?! Why?! Lol) so i’ll Let you know how that holds up! Hi! First off I am soooo sorry for the extremely late response. We took a long break from the blog this year. Have you finished up your playhouse!? I want to see it if you are done! Maybe we can help answer some of your questions before it gets to winter. Yes we moved the kitchen to keep it from weathering. I bet if yours is pretty enclosed it would do fine! We have never taken the plastic lavender inside. I just went out to check on it and it actually still looks pretty good for being over 2 years old.